Yesterday was the anniversary of 9/11- but is was also another important day that should be recognized- Grandparents Day. In 1978 President Jimmy Carter declared Grandparents Day a national holiday, and yet to this day 66% of grandparents don’t even celebrate it! What can we do to change that? Perhaps as a family you could start a new tradition! At Capability Homecare we are going to make this a priority. If you are lucky enough to live near your grandparents, there are lots of things you could to make this day special. One clever idea would be to visit your local fire station- bring a treat, take a tour, visit with the firefighters- not only will you honor them on this historic day, but you can enjoy doing something out of the ordinary. Another idea would be to look at pictures from the olden days. Often the photos will create a conversation starter. Allow your grandparent to share stories and memories. You might even consider recording their voice- something that you can pass on to future generations. My sister recently had a wonderful outing with our grandfather. She found a local air show that included the B-29. 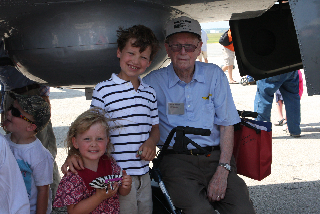 Since my grandfather had flown this plane during WWII, this was a very special way for him to show his grandchildren what had been a significant moment in his life. Other ideas include going to a concert. A local shopping mall offers free concerts every Thursday, Friday and Saturday. These are often a great gathering place for seniors- and a nice opportunity to get out of the house and hear some live music. No matter what day it is- by just taking a moment to recognize and send love to your grandparents will remind them what an important part of your life they are. Being aware of this special day and doing something as simple as a sending a quick email or a card to your grandparents will make them feel appreciated and loved. And in the end- isn’t that what life is all about? Did you celebrate Grandparents Day? What did you to do make it special?